My work is predominantly landscape and waterfalls; a number of these waterfalls are on the Isle of Skye which was my home for some years but I'm now back in Derbyshire and have begun work on local waterfall scenes. I paint in transparent watercolour, without use of masking fluid or body colour; this approach means that paintings take many hours to complete. Some paintings and cards are still available from Skye Makers (Dunvegan, Isle of Skye), and SkyeWorks Gallery in Portree. 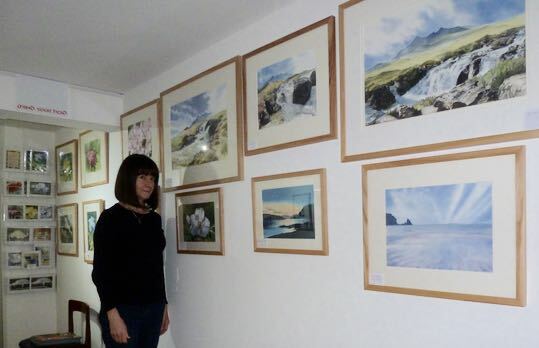 A few pieces of work are now on display at Leabrooks Arts Complex in Derbyshire; I'll share 'featured artist' spot there in April and will be featured artist at Cromford Gallery in May. I had a painting selected for the Harley Gallery Open; Marsco 'framed' sold from the exhibition. I'm working on my first book for Search Press. Experienced Adult Education Tutor. Workshops, classes and demonstrations available. Please note: All images are copyright and may not be used without permission.